Colombo (Sinhala: කොළඹ, pronooncit [ˈkoləmbə]; Tamil: கொழும்பு) is the lairgest ceety an umwhile caipital o Sri Lanka. It is locatit on the wast coast o the island an adjacent tae Sri Jayawardenapura Kotte, the caipital. Colombo is a busy an vibrant ceety wi a mixture o modren life an colonial biggins an ruins, wi a ceety population o 752,993. 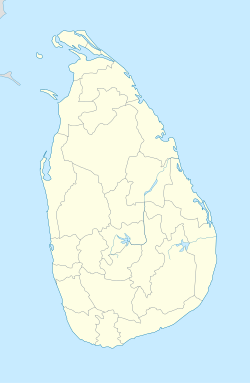 The Colombo Metropolitan Region, defined bi the destricts o Colombo, Gampaha an Kalutara, haes an estimatit population o 5,648,000, an covers an aurie o 3,694.20 km². Map o Sri Lanka showin the location o Colombo. Due tae its lairge harbour an its strategic position alang the East-Wast sea trade routes, Colombo wis kent tae auncient traders 2,000 years ago. Housomeivver it wis anerlie made the caipital o the island when Sri Lanka wis cedit tae the Breetish Empire in 1815, an its status as caipital wis retained when the naition became independent in 1948. In 1978, when admeenistrative functions wur moved tae Sri Jayawardenapura Kotte, Colombo wis designatit as the commercial caipital o Sri Lanka. Like mony ceeties, Colombo's urban aurie extends well ayont the bundaries o a single local authority, encompassin ither Municipal an Urban Cooncils. The main ceety is hame tae a majority o Sri Lanka's corporate offices, restaurants an entertainment venues. Famous landmarks in Colombo include the Galle Face Green, the Viharamahadevi Pairk as well as the Naitional Museum. The name "Colombo", first introducit bi the Portuguese in 1505, is believed tae be derived frae the clessical Sinhalese name කොලොන් තොට Kolon thota, meanin "port on the river Kelani". It haes an aw been suggestit that the name mey be derived frae the Sinhalese name කොල-අම්බ-තොට Kola-amba-thota which means "Harbour wi leafy mango trees". Housomeivver, it is an aw possible that the Portuguese named the ceety efter Christopher Columbus, the Italian sailor who lived in Portugal for mony years afore discoverin the Americas on behauf o the Spainyie monarchs Ferdinand II o Aragon an Isabella I o Castile. His Portuguese name is Cristóvão Colombo. Colombo set sail wastwards tae leuk for Indie aroond the same time Portuguese sailor Vasco da Gama set sail eastwards, landin at the Port o Calicut in Indie on 20 Mey 1498. Colombo landit in the Americas sax years afore that on 12 October 1492 an wis awready a famed sailor an splorer, celebratit baith in Portugal an Spain bi the time Dom Lourenço de Almeida accidentally landit in the port o Galle in 1505. ↑ 1.0 1.1 Census July 2011 (via. Citypopulation.de. Retrieved on 2011-10-17. ↑ Jayewarden+-e, Mr. "How Colombo Derived its Name". Retrieved 2007-01-18. ↑ Department of Census and Statistics, Sri Lanka; Statistical Abstract 2007, Estimated mid year population by district, 2002 - 2006 (pdf-file) Total population of the three districts of the Colombo Metropolitan Region. Retrieved on 2008-12-31. ↑ Buildsrilanka.com; Summary of the CMR Structure Plan Definition and description of the Colombo Metropolitan Region. Retrieved on 2008-12-31. ↑ "History of Colombo". Retrieved 2007-03-21. ↑ "Colombo - then and now". Padma Edirisinghe. The Sunday Observer. 14 February 2004. Wikimedia Commons haes media relatit tae Colombo.